Have you ever noticed how metals that are left in water for an extended amount of time begin to form rust on their surface? In bodies of water, the production of rust on a non-living, inanimate object from iron metal is produced via a chemical reaction. This is known as the abiotic oxidation of iron. However, there are also microorganisms in these bodies of water that compete for the limited availability of iron with the abiotic oxidation of iron. These microorganisms are iron-oxidizing bacteria, which process iron for energy, and correspondingly, create complex structures made out of rust – stalks and sheaths – in freshwater and marine environments. 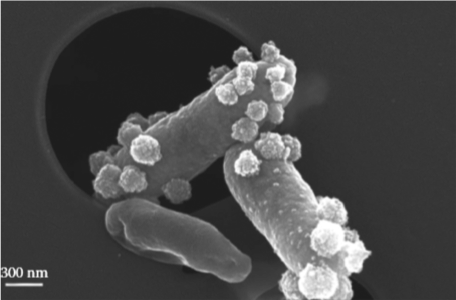 Similar to human engineers, iron oxidizing bacteria are ecological engineers that use stalk or sheaths as construction material to produce sustainable environments. At Bigelow, I work in Dr. David Emerson’s laboratory with Dr. Elif Koeksoy examining a new group of iron oxidizing bacteria, known as Zetaproteobacteria — specifically Mariprofundus ferrooxydans. They inhabit marine environments at extremely low depths and microoxic concentrations, which are low oxygen concentrations. The iron oxidizing bacteria gain their energy by transferring electrons between the two states of iron. 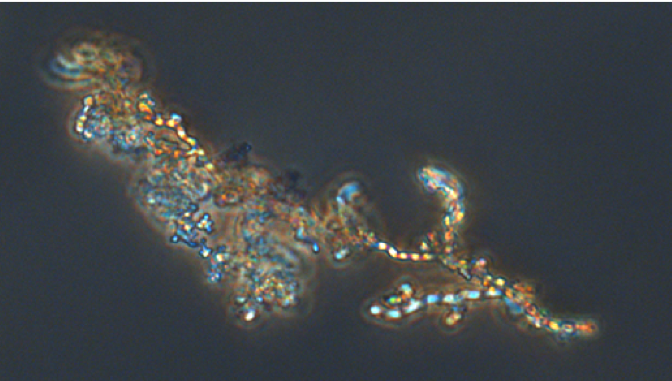 As a result, rust minerals are produced as byproducts that incorporate into twisted stalks, ribbon-like structures that grow out of the microbes, as seen in the image below. These stalks are essential to the survival of iron oxidizing bacterial cells, because they prevent the encrustation of bacteria cells in iron by redirecting the production of iron minerals on stalks, which prevents the cells from being isolated from their energy source, as depicted in the image below. In addition, stalks are holdfasts that anchor the cell in favorable environmental gradients against ocean currents and provide valuable habitats for other microorganisms for a sustained period after the original bacteria dies. However, less is known about the composition of the twisted stalks, which is the primary concentration of my research. Knowing the exact composition of the stalk’s organic matrix — polysaccharides (carbohydrates), proteins, or lipids (fats) — will aid in identifying genes involved in the synthesis of the twisted stalks. Once the composition of the stalks is known, colonies of M. ferrooxydans can be generated to evaluate the suitability of its stalks as nanomaterials and to understand the role of stalks as biomarkers for ancient microbial metabolism. Under precise conditions the growth and development of stalks will vary, however the expertise and knowledge of Dr. David Emerson and Dr. Elif Koeksoy have assisted in offsetting this limitation. Thus, identifying and manipulating these variables will allow large batches of iron-oxidizing bacteria to be grown in the laboratory. In particular, understanding and controlling the formation of twisted stalks has broad applications for the future of nanotechnology. 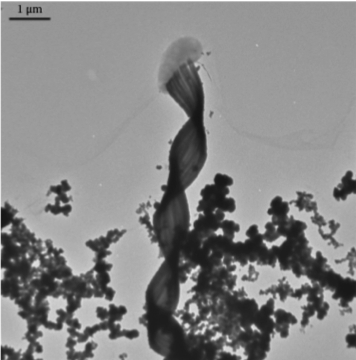 The potential benefits of twisted stalks as nanomaterials include the synthesis of specific compounds and chemicals in a safer and more efficient manner, or usage as a water filtration device that removes heavy metals and other pollutants in communities whose water systems are infected, such as Flint, Michigan. However, the benefits could also influence the electronics industry, by providing high-strength, lightweight nanomaterials that are more cost effective to produce. Garret Genco is a Colby College student in Bigelow Laboratory for Ocean Science’s Research Experience for Undergraduates program. This intensive experience provides an immersion in ocean research with an emphasis on hands-on, state-of-the-art methods and technologies.